Last week, a strange billboard caught marketers’ attention. “I’m concerned about the blueberries,” it proclaimed. 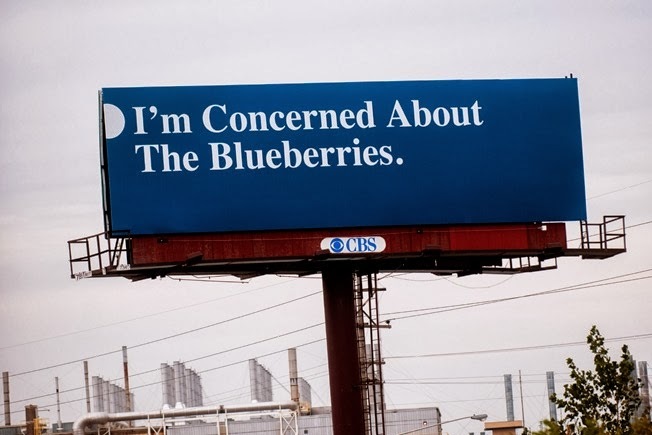 As theories swirled about what’s so concerning about blueberries, marketers wondered what evil genius came up with this great buzz campaign. I, for one, imagined an M. Night Shyamalan sequel to Attack of the Killer Tomatoes. Most speculation about the billboard, which appeared on Interstate 69 in Flint, Michigan, pointed towards some activists/political group trying to make a statement about agriculture, drugs, or corporate America. But, as it turns out, the explanation is much more interesting. Specifically, he was worried there wouldn’t be enough rain for the state’s blueberry crop. As Shaltz thought about this interaction, he began to see “blueberries” as a metaphor. “We all go through the day and we see people who have blueberries—their own issues—and we don’t do anything,” he explained. So he paid for a billboard. Not so much to bring attention to the problem of rainfall and blueberry crops in Alaska, but to remind people to help each other. But I see the problem of blueberry-denial a little differently. From what I can tell, the root of the problem isn’t necessarily that we see each other’s blueberries and decide not to act – it’s that we don’t take the time to acknowledge each other’s blueberries in the first place. Everyone has issues. Some days are good and some days are bad, but we’re all bearing our burdens. Some people do this loudly and some people do it silently. And some people complain loudly about one issue to avoid drawing attention to another. And many people are so busy dealing with their own blueberries, that they forget to inquire about another’s. And many people are so busy hiding their own blueberries, that they forget that other people might care. So, yes, I am concerned about the blueberries. This entry was posted in Marketing Communications, Mental Health on October 21, 2013 by sshugars. I’m concerned about the nebulous metaphors. Ha! That’s a pretty good concern. The metaphor is definitely terrible, but I like the story anyway.